As a German colony from 1884, it was known as German South West Africa (Deutsch-Südwestafrika). Germany had a difficult time administering the territory, which experienced many insurrections, especially those led by guerilla leader Jacob Morenga. The main port, Walvis Bay, and the Penguin Islands were annexed by the UK in 1878, becoming part of the Cape Colony in 1884. Following the creation of the Union of South Africa in 1910, Walvis Bay became part of the Cape Province. In 1915, during South West Africa Campaign of World War I, South Africa captured the German colony. After the war, it was declared a League of Nations Class C Mandate territory under the Treaty of Versailles, with the Union of South Africa responsible for the administration of South West Africa. From 1922, this included Walvis Bay, which, under the South West Africa Affairs Act, was governed as if it were part of the mandated territory. South West Africa remained a League of Nations Mandate until World War II with the collapse of the League of Nations. The Mandate was supposed to become a United Nations Trust Territory when League of Nations Mandates were transferred to the United Nations following World War II. The Prime Minister, Jan Smuts, objected to South West Africa coming under UN control and refused to allow the territory's transition to independence, instead seeking to make it South Africa's fifth province in 1946. Although this never occurred, in 1949, the South West Africa Affairs Act was amended to give representation in the Parliament of South Africa to whites in South West Africa, which gave them six seats in the House of Assembly and four in the Senate. This was to the advantage of the National Party, which enjoyed strong support from the predominantly Afrikaner and ethnic German white population in the territory. Between 1950 and 1977, all of South West Africa's parliamentary seats were held by the National Party. An additional consequence of this was the extension of apartheid laws to the territory. This gave rise to several rulings at the International Court of Justice, which in 1950 ruled that South Africa was not obliged to convert South West Africa into a UN trust territory, but was still bound by the League of Nations Mandate with the United Nations General Assembly assuming the supervisory role. The ICJ also clarified that the General Assembly was empowered to receive petitions from the inhabitants of South West Africa and to call for reports from the mandatory nation, South Africa. The General Assembly constituted the Committee on South West Africa to perform the supervisory functions. In another Advisory Opinion issued in 1955, the Court further ruled that the General Assembly was not required to follow League of Nations voting procedures in determining questions concerning South West Africa. In 1956, the Court further ruled that the Committee had the power to grant hearings to petitioners from the mandated territory. In 1960, Ethiopia and Liberia filed a case in the International Court of Justice against South Africa alleging that South Africa had not fulfilled its mandatory duties. This case did not succeed, with the Court ruling in 1966 that they were not the proper parties to bring the case. In 1966, the General Assembly passed resolution 2145 (XXI) which declared the Mandate terminated and that the Republic of South Africa had no further right to administer South West Africa. In 1971, acting on a request for an Advisory Opinion from the United Nations Security Council, the ICJ ruled that the continued presence of South Africa in Namibia was illegal and that South Africa was under an obligation to withdraw from Namibia immediately. It also ruled that all member states of the United Nations were under an obligation not to recognise as valid any act performed by South Africa on behalf of Namibia. South West Africa became known as Namibia by the UN when the General Assembly changed the territory's name by Resolution 2372 (XXII) of 12 June 1968. SWAPO was recognised as representative of the Namibian people and gained UN observer status when the territory of South West Africa was already removed from the list of Non-Self-Governing Territories. In 1977, South Africa transferred control of Walvis Bay back to the Cape Province, thereby making it an exclave. 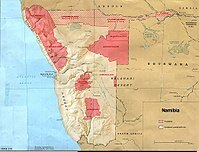 The territory became the independent Republic of Namibia on 21 March 1990, although Walvis Bay and the Penguin Islands remained under South African control until 1994. The South African authorities established 10 bantustans in South West Africa in the late 1960s and early 1970s in accordance with the Odendaal Commission, three of which were granted self-rule. These bantustans were replaced with separate ethnicity based governments in 1980. Allocation of land to bantustans according to the Odendaal Plan. Grey is Etosha National Park. ^ "The End of Apartheid". Archive: Information released online prior to January 20, 2009. United States Department of State. 2009. Retrieved 5 February 2009. South Africa had illegally occupied neighboring Namibia at the end of World War II, and since the mid-1970s, Pretoria had used it as a base to fight the communist party in Angola. ^ Caprivi Strip | Namibia. Namibian.org. Retrieved on 2012-12-18. ^ Mwakikagile, Godfrey (2001). Ethnic Politics in Kenya and Nigeria. Huntington, New York: Nova Science Publishers, Inc. p. 223. ISBN 1560729678. ^ Turok, Ben (1990). Witness from the frontline: aggression and resistance in Southern Africa. Institute for African Alternatives. p. 86. ISBN 187042512X. ^ "International Status of South West Africa – Advisory Opinion". Archived from the original on October 2, 2006. Retrieved 2006-10-02. ^ "Index-United Nations Organisations and Resolutions". www.klausdierks.com. ^ "South West Africa Cases (Preliminary Objections) Ethiopia v. South Africa and Liberia v. South Africa". Archived from the original on October 2, 2006. Retrieved 2006-10-02. ^ "Cour internationale de Justice | International Court of Justice". www.icj-cij.org. Retrieved 2017-09-08. ^ "Treaty between the Government of the Republic of South Africa and the Government of the Republic of Namibia with respect to Walvis Bay and the off-shore Islands, 28 February 1994" (PDF). ^ Cahoon, Ben. "Namibian Homelands". www.worldstatesmen.org. ^ "South-West Africa, Proposed Homelands. in: The Bantustan Proposals for South-West Africa, p 179" (PDF).